Got me a HP laptop. I bought it early last year. It's been a great little computer. Nice and fast. Until about a week ago when we finally got internet back in the house. It used to wake from sleep and be ready for the password to get to the desktop in less then a second after I moved the mouse to wake it. It now takes up to two minutes. The time between the lock screen and when I can input my password has gone from a few seconds to thirty as well. Recent virus scans by Windows Defender and TrendMicro all say I'm clean. Malwarebytes says I have zero infections. Windows update says I have all the latest updates except the latest version of Windows 10, it was buggy so I went back to version 1709. I'm at a loss to explain why the damn thing is being slow, I can only think that Windows is doing so much in the background when booting over the internet that it is being slowed down. Should I turn off some services? Reset Windows? Any help would be appreciated. Thx. Nope. My system is 100 percent all Intel. Except for the Western Digital hard drive. 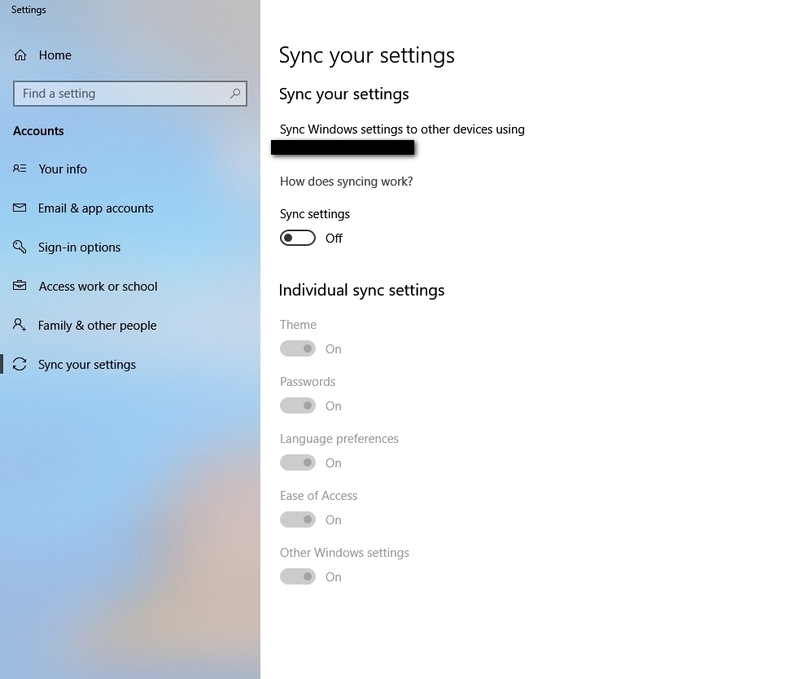 I found this on my Win 10 causing a slow down and higher CPU usage " Sync Settings "
then shut it off and all work faster and better , check your settings might help. Please try the following . For Win7 Users: click Start, in the start search field type 'cmd'. Right-click on the search result and select 'Run as administrator'. Neither of those solutions fixed the issue. Both completed and said nothing was wrong. I still have the issue with long boot times and a sluggish PC when opening apps, using apps, or scrolling online via Chrome. Could memory be an issue? like there are conflicts at work here. Have you tried to defrag. That's a possibility. Windows Media Player has various services that run when connected to the internet, and if you have been disconnected for a while, those and other services may be running over-time to update themselves, etc. What version of Windows are you running? Also, do you notice any glitches at all? I'm just wondering if it's a hard drive problem, rather than a software issue. Does your Laptop have an SSD? Is it getting full? If you rolled back to an earlier version of Win 10 and now have internet after a service break that is likely a suspect. Have you checked start-up? Do a disk cleanup and get rid of the old windows temporary files. CCleaner is what I use, it works great. I have also noticed Win 10 runs slower here when an update is left pending especially noticeable on my laptop. Anyway, good luck sorting it out. get screwed up in the background. The new windows is a hybrid boot. If you turn it off and on it is not a fresh boot. You have to select restart for a fresh full boot. I do a full restart every six days and turn the computer off when not using it. If your anti virus updated the whole program this could cause a slow incomplete boot. The only way to test that is to totally uninstall the anti virus if it is other than Microsoft. I only connect to the wifi manually because automatic can cause problems. @ AzDude - Thanks for the advive about that program, but I use CCleaner and it works just fine. @ admiralWillyWilber - No need. Windows 10 defrags the drive automatically. @ Starkers - I do not use WMP, never have. I use iTunes mostly for MP3 playback. I'm running Windows version 1709. No gl;itches to report and HD health is fine according to 2 different diagnostic programs. @ BigDogBigFeet - No SSD, it has a standard Western Digital 500 GB HD. I only allow 2 things for startup, Dropbox and Windows Defender. Kona, I noticed in the last couple of days that my HP 2-in-1 was a bit sluggish after a recent Windows Update, so maybe you could investigate that as a possibility. The fix was to do a System Restore to before the update. Dunno if this helps but it wouldn't hurt to check it out. Does malwarebytes have realtime protection on if that is true you are running two antivirus on defender, and malwarebytes that will slow down your computers. Nah, I disable Windows Defender when running another anti-malware program, which I much prefer to do because Defender uses way too many system resources in when in 'realtime' mode. Malwarebytes uses far less system resources and is my current choice of anti-malware live scanner. BTW, MS says that when when Windows Defender detects another anti-malware program it will disable itself. That is not necessarily true. I had to manually disable Windows Defender when I installed and activated Malwarebytes, and it's not the first time I've had to do that. I had to do it with Avast and others, so it is always a good idea to check that Defender is not running as well.... otherwise things will get sluggish. Delete the IE Internet files whether you use it or not. After the refresh you could try this. Yeah, that's too often the way with Win 10.... forced updates that bork a machine that was running okay. I recently got a borked machine from an update, but I just did a system restore to rectify the problem. However, I possibly could have avoided it if I hadn't unticked 'Metered Connection' in Network settings. Anyway, I have since hidden that update and hopefully MS fixes the issues before the next one. if you are having any luck speeding up your computer? I read an article on this the other day, it referenced HP PC's and Laptops specifically in which a current Windows Update is causing slow performance, crashes and even making them shut down after a while. The recommended solution was to do a system restore. Best way to try to figure out what might be slowing startup is looking at the Windows Event log (Control Panel -> Administrative Tools -> Event Viewer -> Windows Logs -> System) right after a reboot. A lot of stuff is happening so you will have to scroll down until you see events coming from Kernel-General/Kernel-Power, those usually mark the beginning of the startup process. Pay attention to the time elapsed between each event from then on - if the time interval is unusually long (as in several seconds) then you've basically identified what is stalling startup (it's the event that takes too long to complete). This will usually be a Service (in my system, for instance, the Razer Synapse service is well known to cause huge delays, crappy software). Under Windows 10 I don't know, but on 7 the symptoms are a bit different from what you describe though: you are able to type in a password but then you are left staring at a black screen for several seconds until the desktop appears. Windows 8 was the turning point toward what we have today. I have been observing Microsoft windows updates for quite some time. I have observed not updating windows for quite some time. This is the outcome from updating I have observed. 1 sabotage of the operating system itself. 2 sabotage of non Microsoft software like browsers etc. 3 new ad features which I believe actually make the device less secure. 4 a false sense of security that some people can enjoy. some might be accidental and some might be deliberate. because you can believe what ever you want to believe. Want to know what IS deliberate? Windows 10 *deliberately* delays the startup of 3rd party applications after a reboot by several seconds. Makes Windows appear to boot faster at the cost of other applications looking MUCH slower. I had to come up with a devious work-around for this, as Winstep software features the type of applications you REALLY want to start at the same time as the Windows desktop.